I have an internet-hosted Mac mini running OS X Server, and recently decided to figure out how to host websites on it, and in particular, WordPress websites. After a few struggles and speed bumps, I finally got a site up and running, and wanted to document the process here, pulling together the various bits of information I compiled along the way. I wanted to setup my website using the stock OS X Server resources, and without using something pre-packaged like MAMP. So the first step was starting Server.app, version 4 for OS X 10.10 Yosemite, connecting to my mini, turning on Websites, and enabling PHP web applications (since WordPress is a PHP application). In order for WordPress’s one-click updating to work, the Apache web server process needs permission to write into the folder containing your website files. The way I chose to accomplish this was to run Apache under my local user’s name and group, instead of the default Apache user/group—_www/_www. Only the root user can edit this file, and I know next to nothing about editing files in a Terminal window. In order to edit the file remotely using BBEdit, I needed to be able to login to the machine as root using BBEdit, which I accomplished by adding my SSH key to root’s authorized_keys file. Back in Server.app, I created a new site, leaving all the default settings in place, except for the specification of a non-default location for the website files, as mentioned earlier in this article. 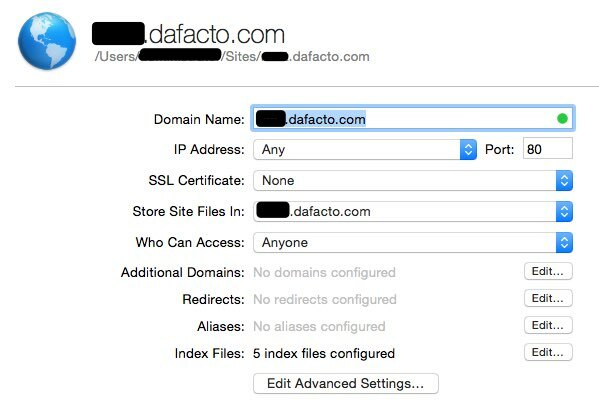 The correct running of WordPress requires access control via an .htaccess file. By default, OS X Server prefers to control access with its own users & groups settings. 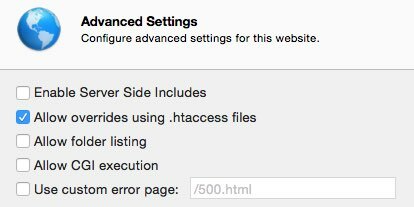 You can override this on a per-site basis by clicking “Edit Advanced Settings” and enabling the .htaccess setting. WordPress requires a MySQL database. The easiest way to install MySQL is running the following command from the Terminal, which downloads and executes a script maintained by the folks at Mac Mini Vault. The script downloads and installs MySQL, installs a preference pane from which you can start and stop the server, sets up the server’s root password and copies that password for you to a text file on the desktop. For me, that all worked fine except the part about setting the root password. A note on the script hints that it needs tweaking for Yosemite, and that an update will be available on December 9th. Today’s December 10th, so I guess they’re still working on it. Once MySQL was up and running, I used Sequel Pro to connect to my mini securely via SSH, and create the database table I would use for my WordPress site. The easiest part was installing WordPress, which just involved going to wordpress.org, downloading WordPress 4, and unpacking its files in the folder I’d created to contain my website. After that was done, I renamed wp-config-sample.php to wp-config.php, opened it in BBEdit, and edited the MySQL username and password and the name of the database I’d created for the website. And with that done, I visited my new website in a browser, and was successfully greeted with the WordPress installation and setup screen. Yeah! 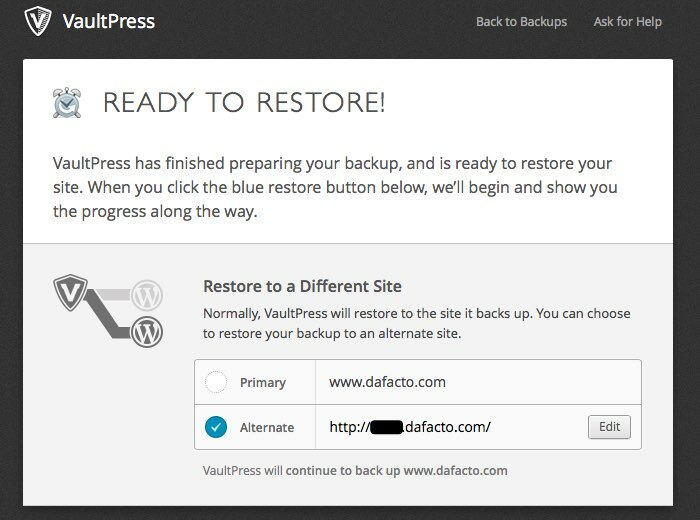 I use VaultPress to maintain a backup of my this blog, which also runs WordPress. And so while setting up a new WordPress site on my mini, I thought I’d try out VaultPress’s ability to restore a backed-up WordPress site to an alternate location, e.g. for times when you might want to migrate your site from one host to another. In VaultPress, I simply provided the SSH login details to the my mini, and clicked go. The process went absolutely smoothly and within a couple of moments I was looking at a pristine copy of my blog running on my Mac mini. My Mac mini is a late 2012 Server model, non-SSD disks, 8GB of memory, and a 2.3GHz Intel Core i7 processor. My blog is hosted in a “DreamPress” installation at DreamHost, which involves a pair of specially-tuned VPSs (virtual private servers), one for the WordPress installation and one for the database server. I couldn’t find memory and processor specifications for the DreamPress product (they only mention auto-scaling resources), and so a direct comparison to the Mac mini’s resources wasn’t possible. Since writing this article, I've moved my WordPress hosting to DigitalOcean. Here's an article explaining why and how. Dear Matt! Thank you for your post. It has been very helpful, but still I didn’t manage to make it work. I have followed your steps, and at the end it works inside my local network, but there is no way to make it work from outside my network. After some thinking time, the browser shows up the html of the WP site, but not the PHP. Do you know how could I solve this? When you set up your MySQL database, do you use your localhost as host? Thank you so much. Hi Constan, I’m not sure I follow what the problem is specifically. There’s no reason why PHP would be rendered when accessed from within your local network, but not rendered when accessed outside your local network. Regarding your MySQL question, yes, I use localhost as the host. Thank you Matt for your quick reply! Happy new year! At the end I managed to solved the problem. It was a fact of IPs! From the external access, the browser tried to connect to my internal IP. Installing Root Relative Path plugin solved everything, in the sense that now every link is relative, and not associated to any IP. Congratulations again for this post! I used your post to install wordpress 4.1 on a mac mini with os x 10.10.2 and server 4, but I did not succeed. In fact, I can not create any new page, items or change the theme. I can only install new plug-ins or add new users. Matt, any idea of how the performance of a 2012 late model Mac Mini (but with 1TB SSD, 16 GB RAM) will perform vs an external host? Hi there, I wouldn’t know specifically, but my intuition is that with the SSD and 16GB of RAM, it would perform very very well. In my experience, the performance of a website is often less dependent upon the host than its on the latency between the client and web server. Many of the website monitors are connected to the internet backbone, thus skew the results. Depending which backbone they use, one cloud provider may seem “faster” than the other. The true test comes when connecting from the last mile networks, that is the ISPs and home networks. If all tests display a page within 1s, I simply look for the cheapest solution. Thus, my macmini in Las Vegas (macminicolo,net) is not only cheaper, but out performed hosting the sites at cloud providers. Putting a CDN in front of it has reduced traffic considerably, but not because of what you would think. Its mostly malicious traffic that has been reduced. That said, I’m not using WordPress anymore. After it was hacked one too many times, I switched to static content generators and simply SFTP it to the mac mini. I’m not really comfortable running WordPress on a system I use for mail, calendaring, contacts and wiki. Next Next post: What caused this customer to delete our app and give it a one-star review?